As any experienced slot player will know, the machines are programmed in such a way that over its lifetime it will keep a certain percentage as profit with the balance returned to the players. For a slot machine that is set at 97%, if it is programmed to spin 250,000 times at £1 a spin, it is set to make a profit of £7,500 with the remainder of £242,500 returned to the player. The machine can distribute the winnings any which it likes. The page “plays” 2,500 sessions at 100 spins each session. No matter how many times you refresh the page, the end result will be the same – a loss of £7,500. During game play, at times the player may be up. At times it shows a large loss with the next session of 100 spins turning into an overall profit only for it to result in a loss at the end of the 250,000 spins. The key to playing any slot machine is to know when to walk away. Temptation when you’re in profit is to continue playing but in reality you’re better off walking away and pocketing the money. On the other hand, when you’re at a big loss, theoretically speaking the machine should turn and return some of your losses. But that may depend on your bank roll. Are you prepared to invest even more money and potentially throw good money after bad? There are no tricks to playing slot machines. At the end of the day it is down to good old luck whether the machine is in a giving or taking mood. Make sure you set yourself a loss target and know when you’re prepared to pocket a profit. As long as you stick to these simple rules, you can’t go wrong and make playing slot machines an enjoyable hobby that potentially could be a profitable one. Not sure where to play? Check out our review section for casinos that are highly rated. As the previous post stated, £300 was deposited at Videoslots Casino because “the wild line must be due”. Statistically speaking, it has been worked out over millions of spins, a 5 wild line features appears every 135 spins on average. And that is just it… it doesn’t appear each 135th spin. You could have two of them within 2 spins for all the slot cares. The session was quick and not so sweet at all. Basically, the machine was playing like dirt. Bonus rounds few and far between, ordinary win lines not appearing and the money could have easily be burned to give better pleasure. The first 1,050 spins at £0.45 bought the balance down quickly to just over £150. During those spins, there were just the 7 bonus rounds (once every 150 spins on average) paying a very poor 20x bet on average. RTP at that point in time was a very poor 69.1% indicating the poor play time encountered. Considering the slot was not playing well at all, with the benefit of hindsight I should have called it a day and cashed the remainder of the money in and reduced the losses. But no, I thought it may be wise to give the Netent slot Twin Spin a go for 100 spins. Twin Spin is a slightly lower variance game. It is a 243 ways 5 reels / 3 rows slot. Two of the reels are joined together. The game does not have a bonus round, but on occasions the remaining up to 3 reels are joined with the other 2. When that happens, the bigger money can be won. The ideal spin is to have all 5 reels join together, which doesn’t happen very often. It did for me during the 100 spins at Videoslots but it paid a very disappointing 12x bet. The 100 spins on Twin Spin didn’t pay off. 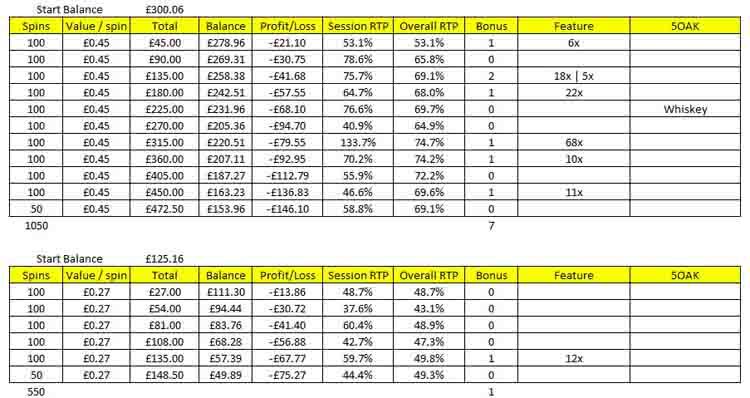 I was hoping to increase the £150 balance but it went down to £125.16 making the Twin Spin session a very disappointing 42.4%. So back to Dead or Alive. What a mistake that was. One of the worst session I played ever and I quickly cashed out on just under £50 because wasting money in such a manner is not my idea of fun. 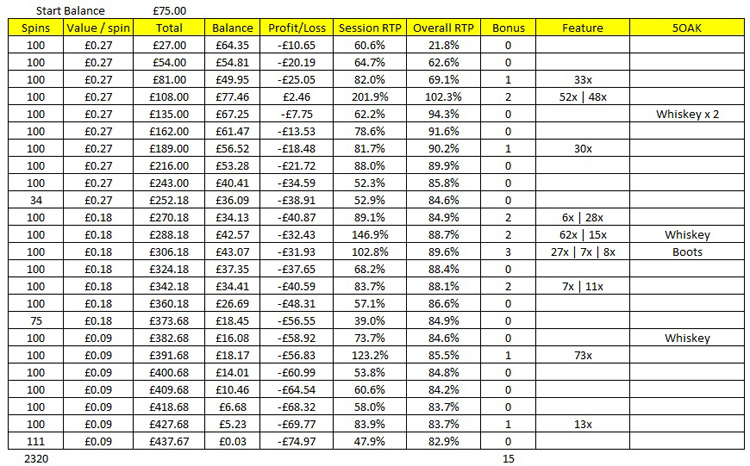 The spins were all at £0.27 and I managed 1 feature during the 550 spins that paid a paltry 12x bet. An RTP of 49.3% sums it about up! So, as the title of this post says, this was the final session of this slot for a while. I certainly spent my budget on this game over the past couple of days and I am not one for chasing losses. Overall, I am well up on this slot and I want it to stay that way! When the cashback that I earned playing the £550 and the money from the race at Videoslots hits my account next week, I will play this slot again at my usual strategy of no more than £0.27 per spin and reducing the stake as the balance goes lower to get most playtime from the slot. Though I usually play at no more than £0.27 per spin and making relatively low deposits, given that it had been a while since I had the extra 5 spins (and therefore the chance of a wild line) during the bonus round, I thought it wise to deposit £300 at Videoslots casino and play at £0.45 a spin. What I didn’t expect was such a long session. From deposit to having a balance of £41.18, I played a total of some 16 hours at £0.45 a spin. During all of that time, a total of 8,030 spins were made and the bonus round triggered a total of 57 times. During this mammoth session, the balance peaked at just £326 – not enough to justify a withdrawal. 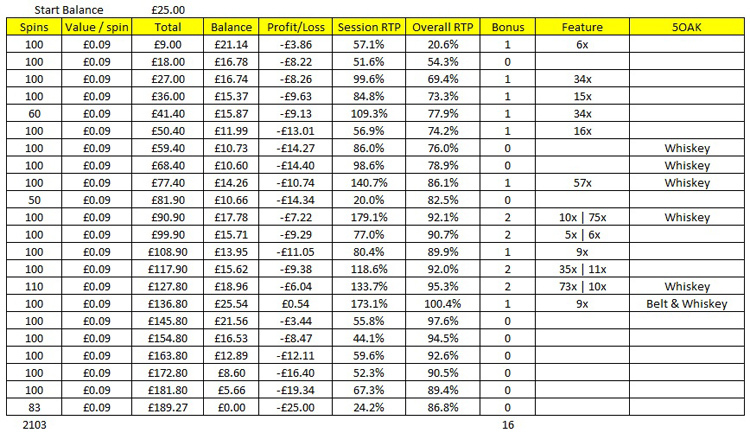 The total Return To Player was a massive 92.8% – very close to the machines theoretical RTP of 96.8%. However, what didn’t happen was a decent win to warrant a cash out. And despite all of those bonus rounds, no extra spins were given during the free spin rounds. Having a balance left of £41.18, I spent £32.18 on Raging Rhino that, as per the previous post, has just been added at Videoslots Casino. That money didn’t last long at all – just 200 spins without any bonus round. The remaining balance of £9 plus a £7.50 win on Raging Rhino as a result of 15 free spins gifted by the casino, was “invested” in playing yet another session of Dead or Alive. The £16.50 lasted a reasonable 1,825 spins and 10 bonus rounds at £0.09 a spin. The RTP for this session was a, once again, reasonable 90% on the nose. Since the last 5 wild line win, a total of 26,486 spins have been made and a total of 170 bonus rounds played. Considering that a wild line happens approximately every 135 bonus rounds or so, statistically speaking I am due a big win soon. With that in mind, I will chance my luck and deposit another £300 at Videoslots… an update concerning this upcoming session will follow in due course. The third session of the day on the Netent slot Dead or Alive was played at Videoslots casino. A deposit of £75 was made and the usual strategy of £0.27 a spin to start with, dropping down to £0.18 a spin at £36 and £0.09 a spin at £18 was applied. Though the end result was a bust, at least the bonus rounds were ticking along nicely. On average there was a bonus round every 117 spins. These bonus rounds, though, paid very poorly at an average of just 12x bet. During the 1,527 spins that this session lasted, there were 3 winning picture lines during ordinary play. In total 464 of the spins counted towards the weekly slot race that is held at Videoslots casino. Each time you make a spin on any of their slots over £0.20 it is added to you weekly total of spins with cash prizes for the winners on a weekly basis. I too, earned some cashback because 25% of the casino’s profit is returned proportionally to the player depending on how much is played through. Try chancing your luck at Videoslots? So far, today, two sessions at the Netent slot Dead or Alive. Not that it makes, or rather should make any difference, but a hasty change of casino was needed. A few clicks later on the internet browser and £25 was deposited at Unibet casino in the hope that there would be a win or at least some decent play time. Since the last 5 wild line mega win, the slot has spun 15,104 times for me during which 90 bonus rounds were triggered. People have gone through the effort of collating statistics over millions of spins, and it is said that the wild line is given every 135 rounds or so. I am still awaiting the 5 scatter win (2,500x bet) during normal play. If that is ever going to happen is to be seen. Despite the last post saying the Netent slot Dead or Alive will not be played for another 4 days or so, an email from Betat Casino dropped into my email box. It was then I noticed that I hadn’t played at the Casino for a while. If only that email never arrived, I would have been £25 better off. The session started really well. The very 1st spin resulted in a bonus round that paid 33x the bet size of £0.09. By the 50th spin, the slot was generous enough to give me a total of 4 bonus rounds! At the end of 100 spins, I was up £10.34. With the benefit of hindsight, I should have cashed out there and then, but when the slot plays like this, you feel inclined to keep playing. Needless to say, things went slowly but gradually wrong from there. The money lasted a total of 1,714 spins with a total of 15 bonus rounds played that paid an average of 24x bet. Basic maths tells us the bonus round was triggered every 114 spins, which is not too shabby and well under my current average of a bonus round every 160 spins since I started to keep detailed play statistics. The casino until the end of August 2015 has a summer contest on the Casinomeister website. Each member of Casinomeister can enter the competition when playing at Betat casino and is in with a chance of some serious money if you’re lucky enough to get a high paying win. To join the excellent Casinomeister forum, please click here. A £75 deposit was made at Videoslots casino to be played on the Netent slot Dead or Alive. The usual strategy was applied – start off with £0.27 a spin, drop to £0.18 a spin when the money goes down to £36 and finally drop to £0.09 a spin when the balance hits £18. This system ensures at least 200 spins on each of the remaining balances. The session didn’t go too bad resulting in 2,320 spins with a RTP of 82.9%. A total of 15 bonus rounds were awarded that paid an average of 28x the stake. The bonus rounds were triggered every 154 spins on average. Since the last big 5 wild line win, a total of 11,372 spins have been made with the bonus rounds awarded 69 times. £125 has been invested since the last big win, so let’s see what the return is once the next big win comes in. This £125 does not include any cash back money received or money earned during the Videoslots race. It basically only includes money that went out of my bank account. The next session of Dead or Alive play will not be for another 4 days or so. Work is calling and it is now time to give slot play a rest until then. The starting point next session will be monies received from Videoslots earned because of cash back and the weekly casino race. You too can earn this money by playing at Videoslots. They have a great welcome offer currently of £10 free money, a 100% first deposit bonus match and 11 free spins on the Netent game Starburst. Dead or Alive slot play – who pressed the off button? A £25 deposit at Unibet casino resulted in one hell of a roller coaster session with it feeling like somebody pressed the off button towards the end of the session. The slot was on fire for the first 1,520 spins with a feature trigged on average every 95 spins. During these spins, 7 pictures on a winning line were also given by the slot, including the lucrative gun belts. At that point in time, my balance was were it started at £25.54. And then it happened. It is like someone thought “enough is enough” and pressed the off button because it went downhill from there very fast. Another 583 spins later and it was good night Vienna so to speak. The balance was down to £0 with no features or significant wins during normal play. I have never experienced that before, from win to bust so quickly. The overall session was average with an RTP of 86.8% and a feature every 131 on average. The feature paid an average of 25x the bet. Online slot machines are not supposed to have a memory. Each spin is independent from another and previous play is not supposed to be taken into account. It is supposed to be truly random, just like rolling dice is. Although I am a firm believer of this, it did cross my mind during those last 583 spins whether this is the case or not. It truly felt like the machine had enough from the giving and that it was time to take back – very quickly. At some point, I thought of giving up and playing a little later when the machine is in a giving mood again. But I decided against this, because if the machine is genuinely random, it doesn’t have a hot and cold spell. Reality, though, feels different at times. What this session does confirm though is the high variance of the machine. From win to bust in just 583 spins is what I would call a nightmare session with an RTP of just 52.4%. You can’t almost get worse than that. Fancy a roller coaster ride on slots? Why not check out our casino review section for a selection of quality casinos that offer some good incentives. Whether that is deposit matches or extra spins, you can be assured of a good deal.